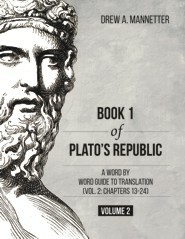 Volume 2 of this new grammatical reader on chapters 13 through 24 of Book 1 of Plato's Republic is the most thorough of available resources, designed for students who have only basic skills as well as those at a more advanced level. The text is complete and not adapted; no difficult passages are excised. The running vocabularies are complete, providing the reader context specific meanings. The text is broken down into sentences, providing a manageable amount of material, and space is provided for translation after each sentence. Every construction and word is discussed in detail and referenced to Smyth's Greek Grammar for further explanation. The details of the text, accents, conjunctions, adverbs, and particles, are not minimized but receive thorough treatment as well. The presentation allows for beginning students to make thorough use of the notes while more advanced students are able to consult the notes only when necessary and thus build up speed in translation. 2) Full running vocabulary; no words are omitted. 3) Every word is discussed; none are omitted. 4) Every construction is discussed; none are omitted. 5) All particles are explained; none are omitted. 6) Every word and construction is cross referenced to Smyth's Greek Grammar for further explanation. 7) Room is provided after each sentence for translation. 8) Accentuation, where challenging, is discussed. Drew Mannetter is an Associate Professor of Philosophy and Classics at the College of Saint Scholastica in Duluth, MN.